The Coastal Christmas Tree needed a special tree skirt. Burlap was the perfect choice for the tree skirt, natural, textural, and the color of sand! Not owning a sewing machine, I looked for a no-sew option instead. 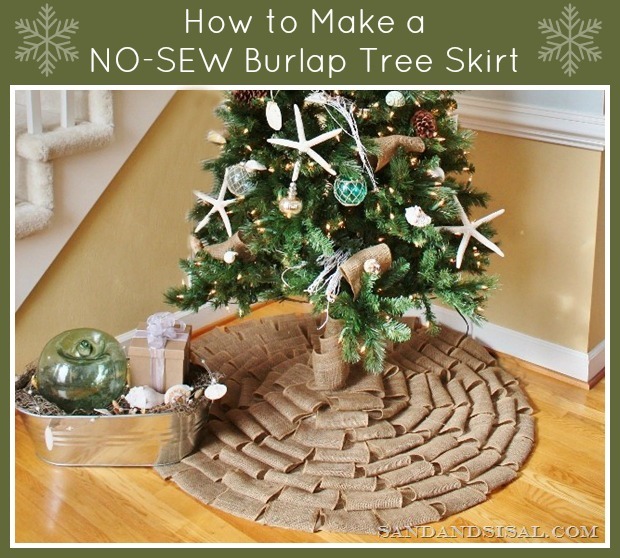 This burlap tree skirt couldn’t have been easier to make! Today I’ll show you how! Start by spreading your tablecloth out on the floor. Find the center, and with a pen, trace around a small saucer to make a circle. Cut a straight line to the center and make a series of cuts from the center to circle you just traced. At a later time you will fold those little triangle flaps under and glue. The burlap garland is very inexpensive. I had used the garland before, to make a big bow on my Coastal Holiday Wreath. The next step is to cut the burlap garland into approximately 9 inch pieces. Make a loop out of each burlap piece and secure ends with a few dots of hot glue. Once all your loops are made start laying them around the perimeter of the cloth. Run a line of fabric glue along the top edge of your loop and secure to the table cloth. Lay out your second row, glue, and repeat until all the fabric is covered. My tree is an artificial tree, and I did not like seeing the green metal “trunk”, so to remedy that, I simply loosely wrapped a piece of the garland around the trunk and tucked it into the skirt. The kids commented that all the burlap loops make the tree skirt look like a gigantic Christmas bow! I love all the ruffled texture the loops create. This No-Sew Burlap Tree Skirt was the perfect finish to my favorite Coastal Christmas Tree! And all it cost was an inexpensive tablecloth and a few rolls of burlap garland! Tree skirts are so easy to make I don’t think I’ll ever purchase one again. I love this amazing tree skirt! You are so creative to have come up with this idea. I love that it’s no sew too. What a great idea and great job! It looks fabulous! Wow – that looks amazing. You did a wonderful job. So creative. This is adorable and love thatit’s no sew. I found the burlap ribbon 2 wks ago (w/my 40% coupon!) and have been using it ever since! – mantel scarf, 48″ wreath and any place else, lol! Love your tutorial and really love that I’m not the only one w/o a sewing machine! Hear, hear for fabric glue! great idea! would never have thought of that. I think you are definitely my new favorite blogger! I LOVE all of your coastal ideas! I’m SO going to have to make one of these for next year! I love burlap and don’t know how to sew so this is perfect! Definitely pinning this idea in case I want to make a new skirt for next year. Great job! This is amazing it looks beautiful what a wonderful idea. Just found your beautiful blog and have enjoyed looking around. I’m now following you so I can visit you often. hope you have a great day. Kim, I just Love it! Thanks for Sharing!! Stop it! Seriously!? It’s adorable! Pinning and tweeting. Kim, it is GORGEOUS!!! incredible work!!! Love this and so very much love that it’s NO sew! Never would’ve guessed that’s how you made it!! Great job! LOVE this! I have the same burlap from michaels and used it as garland in my tree. I can’t sew a button so this is perfect! New follower. This is a fabulous tree skirt! I absolutely love burlap and I truly adore this skirt. Thanks for sharing! Love the tree! My first year to have a coastal tree. Always wanted one. Thanks for the ideal for the tree skirt. I plan on making one. Lovely Kim! Where can I find the tablecloth? Michaels was out of the rolls of burlap when I went but I got 3 yards of it instead. I was wondering what the width of the 9 inch pieces you cut were? types or loans, for those types of credits.